As of March 2010, Tripura had 242 industrial units. Of these while 94 per cent were micro units, remaining were small units. More than half of these units are located in the West Tripura district of the state whereas 14 per cent units are concentrated in the North Tripura district. About 2500 persons are employed by these industrial units which had invested in 11.77 crore. 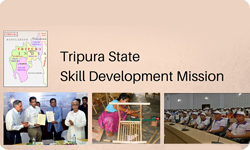 According to National Skill Development Corporation, as of March 2010, Tripura had 1,648 registered factories. These factories gave employment to 57,873 persons. The number of factories rose at a compound annual growth rate (CAGR) of 1.2 per between 2002 and 2010 whereas employment increased at a CAGR of 7.8 per cent during the same time. With 57 per cent, West Tripura district has the largest share of these factories whereas Dhalai district has just 5 per cent. Agriculture and allied sectors provide employment to about 51 per cent of the total workforce of Tripura. Horticulture, handloom and handicrafts are other sources of income. West Tripura district has the largest percentage of non-agricultural workers. Handloom, manufacturing, handicrafts, tea and rubber are the sectors which employ people in Tripura. In 2013, the Modified Industrial Infrastructure Upgradation Scheme (MIIUS), approved by the Cabinet Committee on Economic Affairs under the 12th Five Year Plan, was implemented with the objective to create employment opportunities. 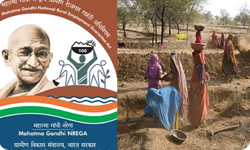 According to the Union rural development ministry, Tripura has achieved the first position in the country in 2015-2016 by creating on an average 94.66 mandays of work for Mahatma Gandhi National Rural Employment Guarantee Act (MGNREGA). In May 2015, an apparel and garment making centre foundation was set up in the capital of Tripura, Agartala, was inaugurated. Added to this a silk processing and printing unit was set up. The establishment of these silk units is expected to generate employment opportunities in the state. In 2009-2010, Tripura was home to 1,674 co-operative societies that employed 6.47 lakh members with a total working capital of Rs 910.44 crore.